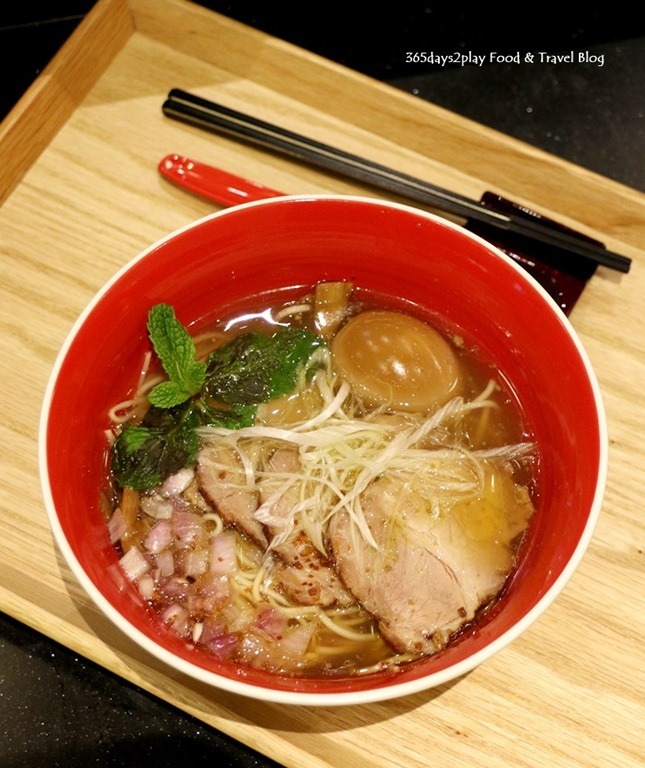 Tsuta Singapore: Would you enjoy world’s first and only Michelin-starred ramen eatery? 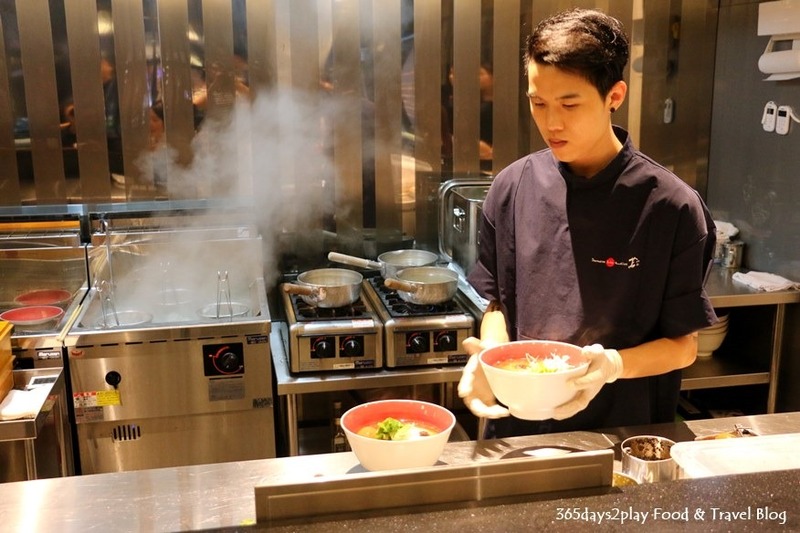 Japanese one Michelin-starred ramen eatery Tsuta will be throwing its doors open to welcome diners in Singapore come November 6. The brainwave of owner Yuki Onishi, Tsuta opened in Jan 2012 in Sugamo,Tokyo. Within a short span of 3 years, it was conferred a one-star Michelin award in 2015, and currently remains the world’s only Michelin starred ramen eatery. Interestingly, it’s called Japanese “Soba” Noodles in Japan, rather than “ramen” because of the higher quality of noodles. The outlet in Tokyo is a 9-seater establishment. Apparently, hundreds of hopeful diners in Japan begin queuing at 6 am for a ticket to dine at the restaurant even though the restaurant only opens at 11am, and only serves a maximum of 150 bowls of noodles daily. 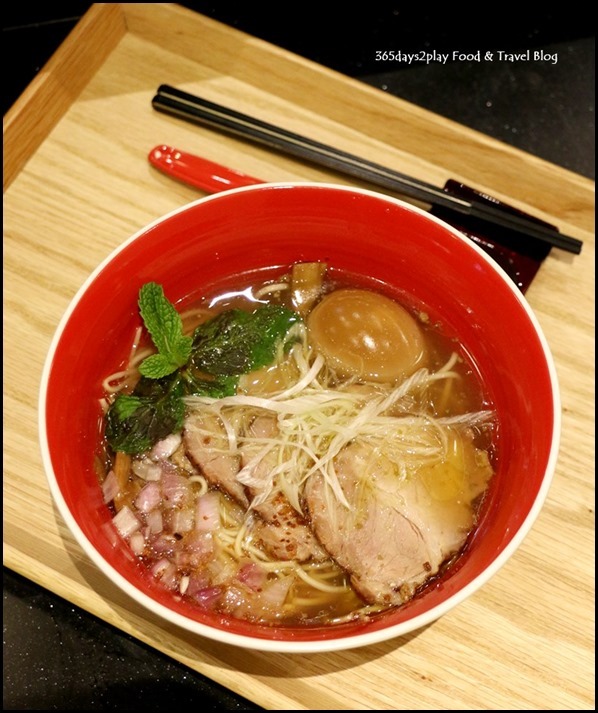 We are slightly luckier in Singapore because Tsuta Singapore at Pacific Plaza seats 18, and is open from 11am to 10pm. Currently only the Shoyu and Shio soup bases are available, and at a later phase, the miso soup base. 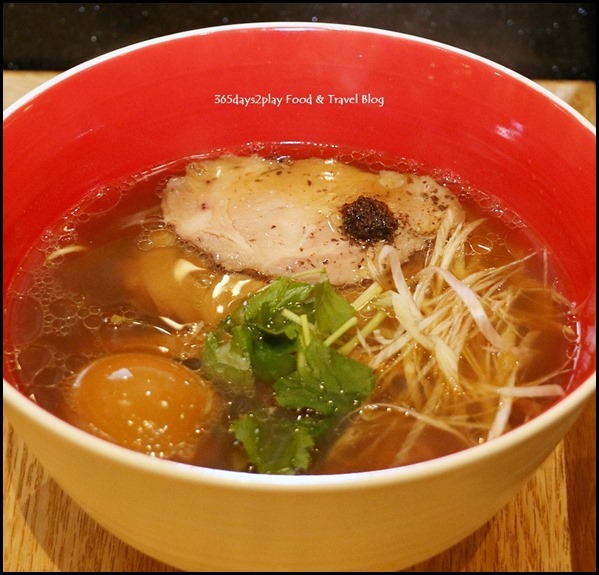 The Shoyu Soba features black truffle pureed in truffle oil while the Shio version has green olives pureed in truffle oil. So, with the introduction settled, let’s get straight to the chase, was the ramen that I tried yesterday tasty and worth a Michelin Star? It depends on which aspect of the ramen dish you are talking about. On the whole, I loved the noodles and the char siu, but I didn’t enjoy the soup base. Depending on your preferences, you may love Tsuta or you may leave unsatisfied. I loved the texture of the ramen. 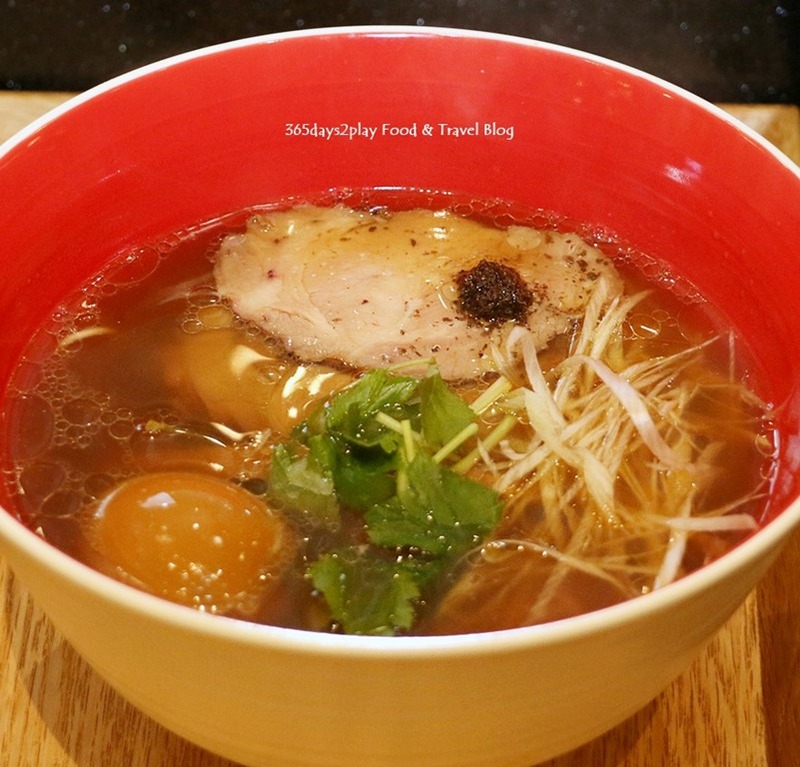 It was firm and had a good bite to it, quite similar to what I’ve tried at Ippudo or Tampopo. Apparently the noodles are handmade on-site, and made with a blend of several types of whole wheat and whole grain flours. 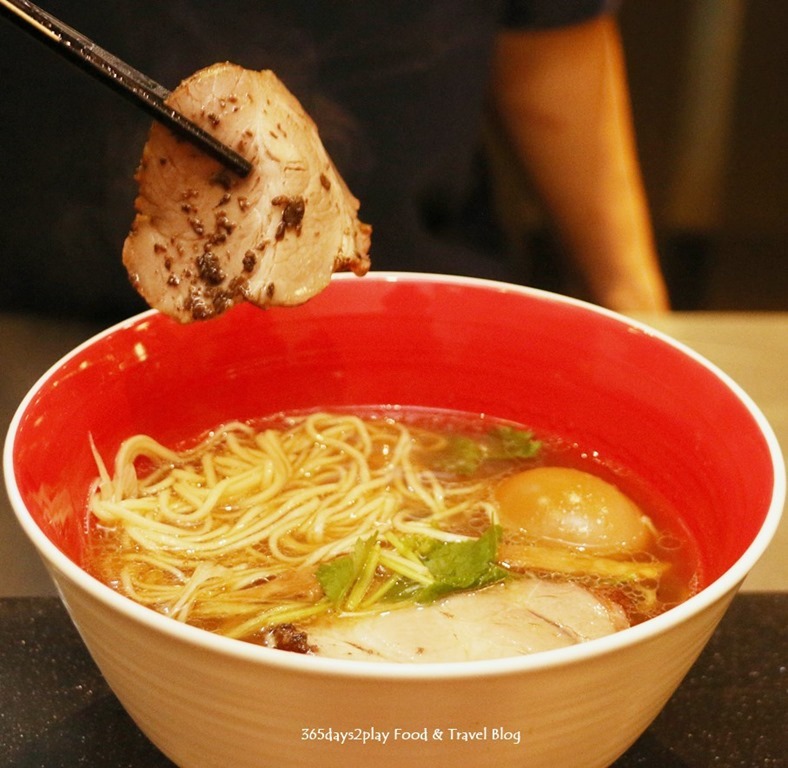 Unlike many other ramen establishments, the char siu here is succulent and less fatty. Despite that, I found it to be tasty and still tender enough. My dining companion however preferred the melt-in-the mouth char siu from other restaurants, ie the fatty types. I like the fatty types too but I also like this version of more meat and less fat. The egg was nice but definitely not the best I’ve had. The yolk was only somewhat flowy and the white was already quite firm. In my opinion, this is the contentious bit, and possibly the make it or break it factor for some. I tried the Shoyu version and found the soup to be much lighter as compared to many of the the popular ramen outlets in Singapore. This is so because Tsuta’s broth is made using whole chickens as compared to the tonkotsu version ie pork bones. I prefer the richer tonkotsu version but if you like something light, less salty and less oily, Tsuta would be perfect for you. I also didn’t like the truffle flavour permeating throughout the soup. I love truffle fries (yes I know it’s just a chemical essence), and I love real truffle shavings in pasta, but I thought that having the entire ramen broth full of truffle essence was just too much for me. There’s no escaping it either since the noodles are soaked in it. Once again, if you love truffle flavour/truffle essence, you’d love Tsuta. Well? I’d say only you know whether you’d love Tsuta depending on your preferences above. I’d be interested to try the Miso broth version when it’s ready. The ramen cost between $15 – $22.80 depending on the number of slices of charsiu (1 or 4) you want and whether you opt for the flavoured egg.